Gorgeous wheel bug nymphs cluster near eggs from which they hatched before venturing off to find their first victim. Baby boomers may fondly recall a regular feature of Mad Magazine called Spy vs. Spy where two pointy-nosed secret agents attempted to outwit and undo each other. In this week's episode, we meet the entomological equivalent. Over the past month, Bug of the Week focused its attention on members of the true bug clan like bed bugs, leaf-footed bugs, and the nefarious brown marmorated stink bug. Weeks ago we predicted the rising crescendo of concern that continues this week as increasing numbers of stink bugs moved from farm fields and landscapes to people’s homes in search of winter refuge (See previous episodes on brown marmorated stink bugs). As we struggle to find ways to protect our crops and prevent stinky invaders from entering houses, we often overlook the fact that one creature’s bane is another’s bounty. Only Mother Nature and the wheel bug know the function of the wheel. On a recent foray to study stink bugs in a nursery, I encountered record numbers of one of Mother Nature’s most awesome six-legged predators, the wheel bug, Arilus cristatus. The common name, wheel bug, stems from the fact that this terror has a structure on its back that looks like some spoke-bearing medieval torture device. The function of this wheel, known only to Mother Nature and the bug itself, has been the source of much speculation but little fact. The business end of the wheel bug is the powerful beak or proboscis stored between the beast’s front legs when it is not in use. Upon spying a tasty morsel, the wheel bug cautiously approaches, embraces the mark with long front legs, and impales the victim with the powerful beak. The wheel bug pumps strong digestive enzymes through the beak into the prey. These enzymes liquefy the body tissues of the hapless victim. A muscular pump in the head of the bug slurps the liquefied meal up through the beak. Young wheel bugs use protein from their prey for growth and adult females convert prey into eggs. In autumn, the well-fed female wheel bug lays barrel-shaped eggs in clusters of tens to more than one hundred usually on the bark of a tree. Eggs hatch the following spring in May and June. 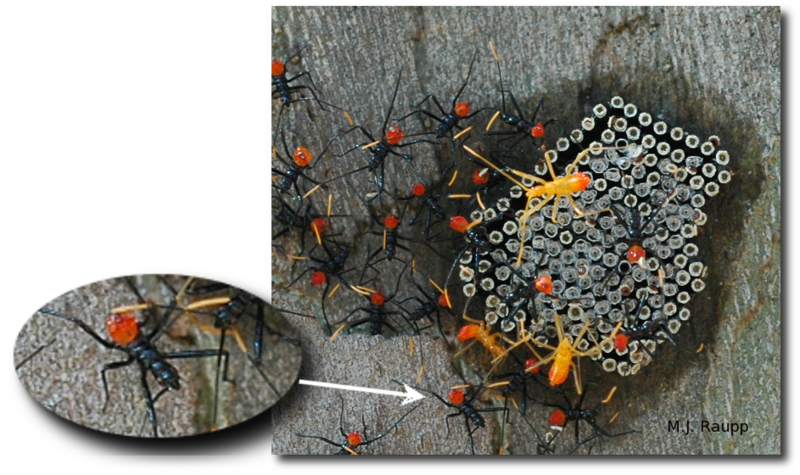 The small wheel bugs, called nymphs, are magnificent creatures with bright red abdomens and orange antennae. They dine on a wide variety of insects including caterpillars, plant hoppers, sawfly larvae, aphids, and beetles. In most years, I feel lucky if I witness a half dozen of these monsters at work in the wild. As I wandered through the stink bug - laden nursery, almost every infested sycamore tree had several wheel bugs in attendance. While I watched, wheel bugs stealthily stalked and assassinated their stinky marmorated cousins, bug vs. bug. One curious irony of the unfortunate stink bug situation is that the outbreak of nocent brown marmorated stink bugs has triggered a complementary outbreak of beneficial wheel bugs. How much benefit results from greater numbers of these assassins remains to be seen, but we hope that these and other naturally occurring predators and parasites will begin to stem the onslaught of brown marmorated stink bugs. If you encounter wheel bugs, please heed this word of caution. Wheel bugs have no particular interest in stalking humans as potential victims. Perhaps we are too large or maybe we just taste bad, but wheel bugs usually retreat as we approach. In capturing one wheel bug named, Assasi, as a pet for our laboratory, I learned firsthand, so to speak, that the wheel bug could deliver a memorable, painful poke with her beak. If you keep wheel bugs as pets beware, try not to handle them directly or you too may become the victim of this clever assassin. Many thanks to Drs. Shrewsbury, Martinson, and Chris Sargent whose fascination with wheel bugs and stink bugs inspired this episode. To learn more about wheel bugs and see more action video, please these web sites.